September 08 - The weather at the beginning of the month began wet and windy. We quite like the autumn months so if it arrived early it wasn't going to be a problem for us. In preparation for our 25 mile charity cycle in early October we tried to get out on our bikes as often as we could at the weekend. After a particularly wet few days the weekend came around and we cycled over to Kislingbury to find the river very high. 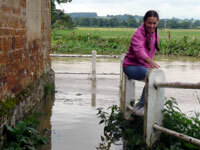 Jane full of daring walked out on the metal fencing above the flood waters. Ten years ago such flooding would have been very serious for Northampton but the flood defences now do their job and although the river Nene gets very high it rarely breaks its banks unless it is onto the planned flood plains. Jane found it more difficult getting back from her little adventure particularly when she discovered a whole load of slugs clinging to one of the concrete posts and slugs are her most loathed creature. 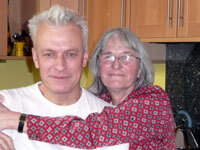 We collected Jane's sister, Ruth, from Heathrow in the early part of the month and then a week later Jane went down to London to bring Ruth and her mother back for a long weekend. 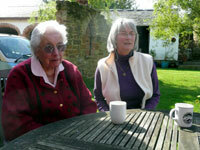 The weather was unusually kind and we even managed to get out onto the patio for afternoon tea and cakes. Steve managed to get the lawn cut in the hope it might be the last time he has to do it this season but with milder winters no doubt he will need to cut it again in early October. Jane's mum always enjoys her stays with is because she gets waited on hand and foot. Her penalty is that Jane takes her out for little walks and trips round the shops. We were very lucky and managed to get two flights in during the month taking our total this year to six, half our normal number and ten years ago Steve would have flown 30 times a year. On this flight we took off from the Marriot hotel near Brackmills and flew west towards Bugbrooke. Part way through the flight we had a problem with the pilot light on one burner and therefore decided to get into the first available field. As it turned out we approached Bugbrooke football ground went up over the floodlights to drop straight onto the pitch. Jane and Val were quickly on the scene only to find the entrance to the pitch locked but thankfully a local allowed us to walk the balloon across the pitch and into his paddock. Our second flight of the month looked as though it would take us across town if we took off from the Marriot and so we decided to travel out to Dalscote with Colin. As soon as we took off we headed straight for town. 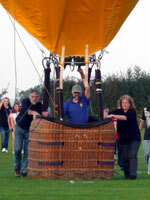 Steve took the balloon high to pick up a wind which took then south of town and Nick landed it just short of Ecton. For Jane the arrival of Ruth meant taking time to meet up with her family. She travelled down to London to go to a stamp collectors fair with Ruth and Richard although her brother had to rush off to a business meeting so spent little time at the Stampex exhibition. Jane had never seen so many stamps. Although the theme was stamps it included postmarks as well as beautifully adorned envelopes which were used prior to the use of stamps. Jane learnt an incredible amount of knowledge under her 'big' sisters guidance. Presents were purchased for birthday and Christmas. Jane has thematics whereas Ruth seriously collects GB and Sudanese stamps, thankfully she had remembered a list of the stamps she wanted to find and was successful at one of the stands. Just outside the village one Sunday morning there was a ploughing competition with very old tractors. These tractors didn't have satellite navigation to guide them across the fields or even roll over cages to protect the driver. They are tested on how straight they plough, even furrows of the same height and depth with the turn round at either end starting and finishing in line. It was a really mild morning and it was obvious that the tractor drivers were really enjoying themselves. 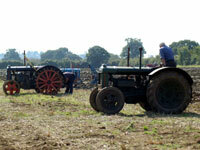 The oldest tractor was a 1938 Fordson. One of the photos were sent to the local rag the Chronicle & Echo who published it on the following Wednesday. Of course September heralds the beginning of Autumn. 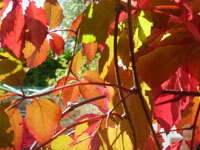 The colours of the Virginia creeper are always superb as can be seen from this picture. This was taken through our kitchen window. We both enjoy this time of year. The colours, the temperature, the fresh morning air, just everything feels good. Sad that the days are starting to shorten.